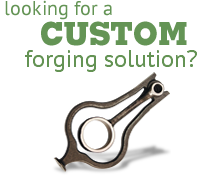 We can custom forge parts up to 15 lbs. in weight, and 32 inches in length, in a variety of carbon, alloy and stainless steel grades. Our standard product lines of forgings include small-to-medium-sized linkage and fastening components that offer superior tensile, hardness and impact strength.